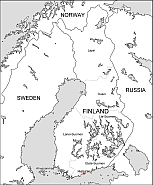 Editable royalty-free map of Finland in vector-graphic online store. Austria free map, Belgium free map, France free map, Germany free map, Liechtenstein free map, Monaco free map, Netherlands free map, Switzerland free map Capital city: Helsinki Area: 130,127 sq miles (337,030 sq km ) Population: 4,998,478 Official languages: Finnish, Swedish Major religions: Christian 91%, other 9% Government: Multiparty democracy Currency: Euro Adult literacy rate: 99% Life expectancy: 78 years People per doctor: 323 Televisions: 640 per 1,000 peopleKNOWN AS “SUOMI” to its people, Finland is the most northerly independent country in the world. An aerial view of this land would show a spectacular pattern of forests, swampy peatland, massive lakes, and islands – scattered in the lakes and along the coastline. Most of it is covered with pine, spruce, and birch trees, and for up to half of the year it is carpeted with snow. 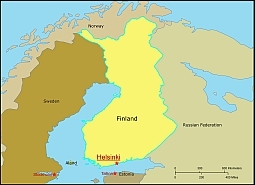 After centuries of Swedish rule, Finland became part of Russia before independence in 1917. Finland has a distinctive language and culture that marks it apart from the rest of Scandinavia.